iBook, PDF and Kindle editions! 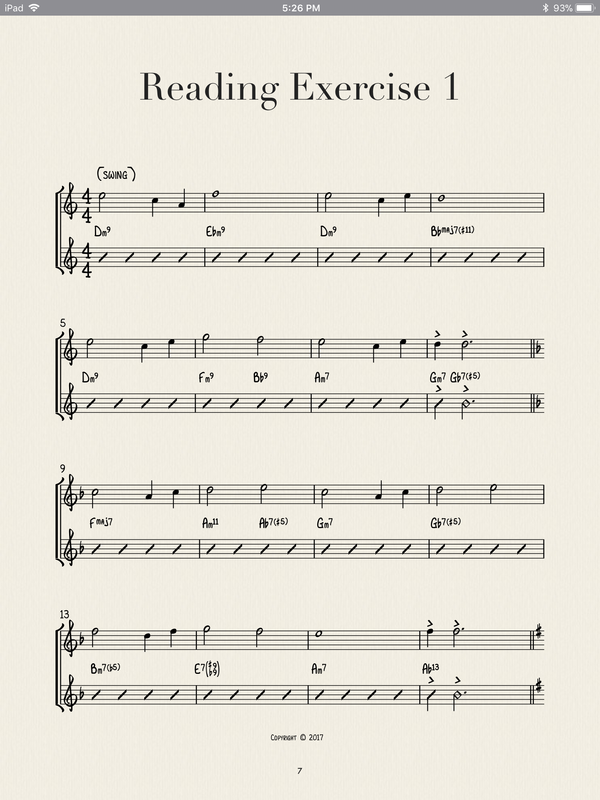 A new sight reading book featuring 34 all original exercises. The exercises progress from an easier level of difficulty to more challenging ones. Also includes a second staff with chord changes. The chord staff includes rhythm and slash marks as well. 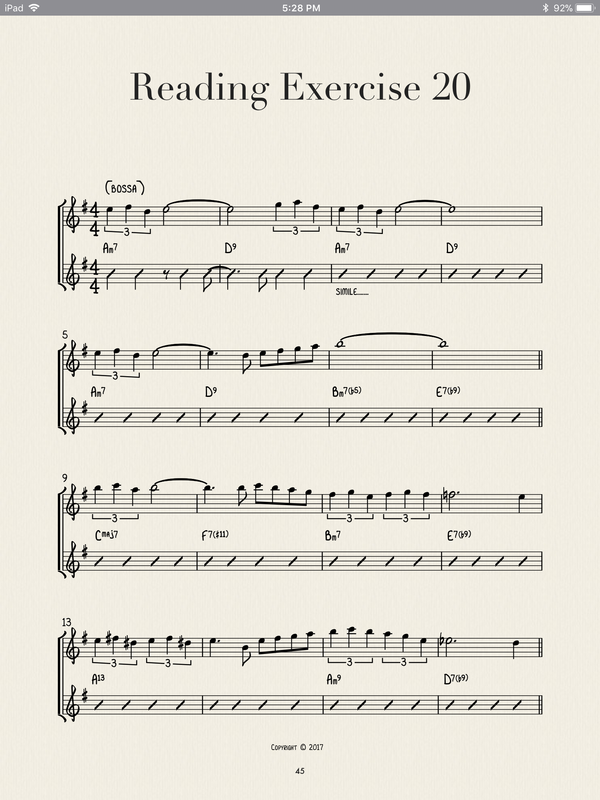 Styles range from jazz standard type tunes to bossa nova, straight 8th, waltzes and modern jazz. 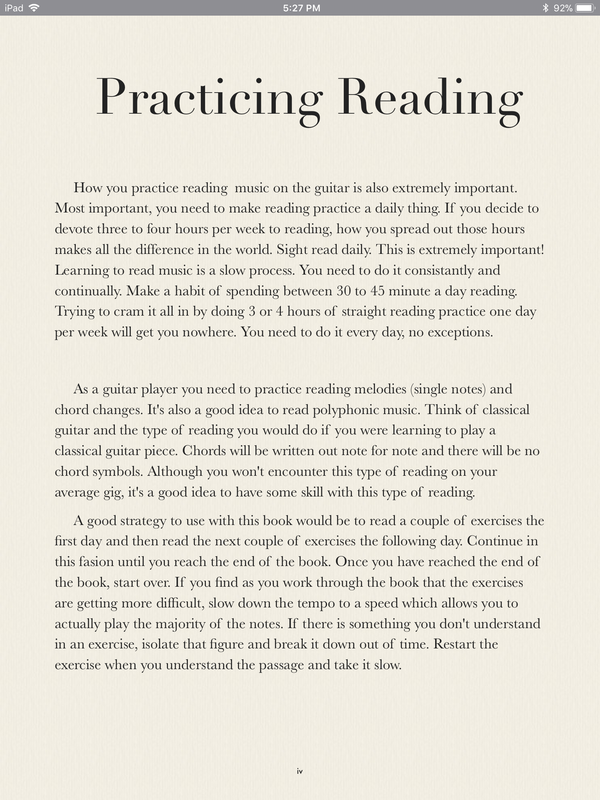 Not a "How To" book on reading but rather a collection of interesting and musical exercises to read. The iBook is 76 pages and the PDF is 75 pages. Both books contain the exact same content. As this is a sight reading book, there are no tabs and no audio examples. 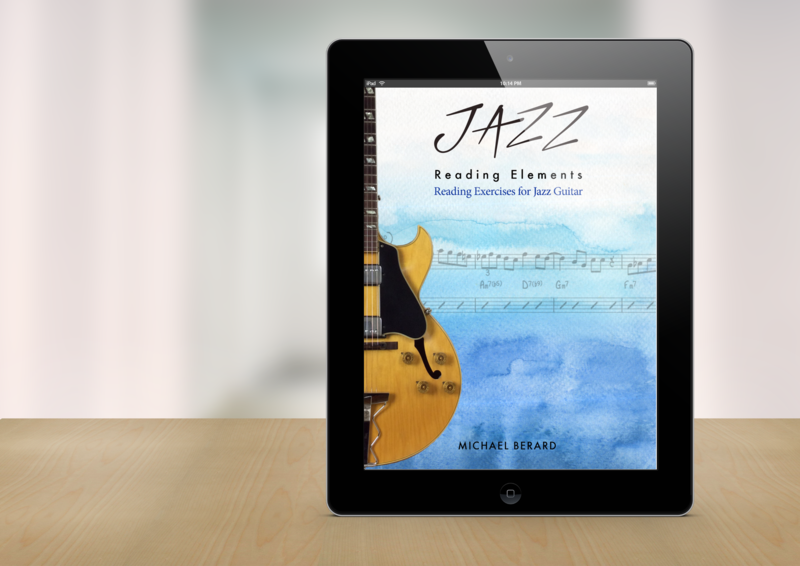 Jazz Reading Elements is purely a sight reading book filled with music reading exercises. Each reading example highlights a particular rhythm or concept and develops systematically becoming more challenging with each exercise. 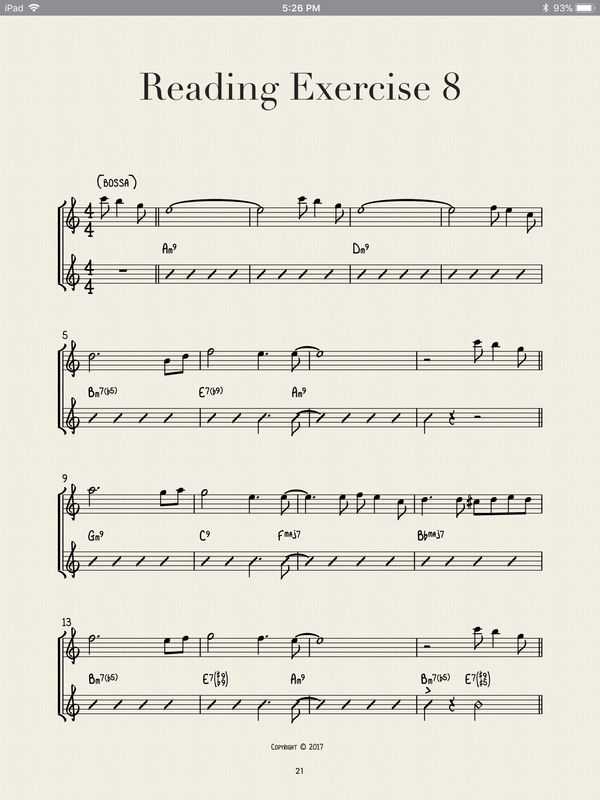 The PDF version of "Jazz Reading Elements" works on any platform including Windows PC's, Chrome OS, Linux, iOS, Mac OS and most devices that can open a PDF file. It is "fixed layout" and not reflowable. For best viewing results, the most current version of any PDF Reader is recommended. The iBooks version is for iPad, Mac and iPhone only. It must be purchased from the iBooks store. When there are updates or content added, you will recieve notifications from iBooks. Updates are free of charge. The Sample iBook is available from iBooks as well. Amazon Kindle Edition works on Fire Tablets, Kindle Fire and on the free Kindle Reading app available for iOS, Android, Mac and PC. It must be purchased from Amazon. Visit Amazon to "Look inside"
If you'd like to get a feel for the book before you buy, download one of the free samples. There are several examples from the beginning, middle and end of the book. These should give you and idea of the styles of the pieces and the level of reading covered in the book. The PDF Sample will either download or open in a new tab. For the iBooks Sample, you will be taken to iTunes or iBooks where you can download the Sample iBook to your iBooks app. *For the Kindle Editions of Jazz Reading Elements, visit Amazon to "Look inside"